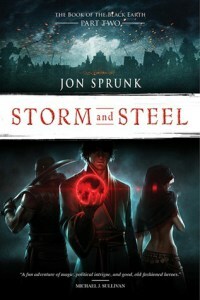 Storm and Steel, by Jon Sprunk, is part two of The Book of the Black Earth. Despite not having read part one, and despite having a somewhat slow start, once I got a few chapters into it, things picked up and the story gained enough inertia to pull me along. There are two main stories here (and several smaller ones): that of the ex-slave Horace Delrosa, and the second of Jirom, a homosexual ex-gladiator and mercenary. Horace, the former slave, turns out to possess a very powerful and innate ability to work the magical energy of Sprunk's world, called zoanii. When Horace's ability reveals itself to the Queen and her advisers (in part one), he suddenly finds himself a member of Queen Byleth's court, and a powerful and unwelcome one at that. Also present in the court is Alrya, Horace's love interest, with whom he struggles to establish the boundaries of their relationship based on his new status. Queen Byleth is pretty ruthless and temperamental, and Horace often finds himself at odds with her demands on his service and his own strong inner morals. When charged with putting down a slave rebellion, in which Jirom is involved as one of the leaders, he's determined to do it differently from the way the Queen demands, which is to simply kill them all. Ongoing with this are his efforts to come to terms with his new position in her court, the enemies that resent his new status, and his new magic-working powers, which consistently evade his attempts at control. Sprunk did a good job developing his characters, giving them different goals and quirks. I did grow a little frustrated with Horace's inability to make any progress when it came to controlling his magical ability. After a while, it simply began to feel like some sort of plot device the author was using to make things harder for Horace than they needed to be. I like that the characters are portrayed as complex individuals with convincing authenticity. There's no black and white in Storm and Steel, only shades of gray. Sometimes the bad guys do good things and the good guys do bad, just like in real life. Having characters like this adds veracity, complexity, and a convincing fullness to the story. It's probably safe to say that if you enjoyed the first book of the series, you'll probably enjoy the second. Storm and Steel delivers satisfying sword and sorcery action using complex three-dimensional characters in a convincingly detailed and fully developed world.